There is something about the sights and sounds on the water at night in the summer that is truly enjoyable. Unless you’ve experienced it, it might be hard to understand. Like most summertime bass fishermen, I get tired of trying to find a peaceful place to fish without the sound of personal water crafts whizzing by. Don’t get me wrong, they have just as much right to the water as we do, but I still get tired of them, unless I’m out riding mine. Needless to say, PWCs are not a problem when fishing at night. Finally, the fish seem to bite better for me at night than during the day. I believe they move shallower, feeding on baitfish in the dark than they do during the day. I also seem to catch bigger fish at night, which really gets the ole’ blood pumping. Lake Whitney is my favorite place to night fish. It has a healthy population of largemouth and smallmouth bass. When traveling to Whitney for some nighttime fishing, I tend to look for the smallies. They are so explosive and such fierce fighters, I love catching them, especially in the dark. 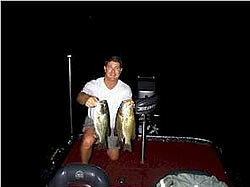 Like I said earlier, unless you have experienced catching a nice sized smallmouth at night, it truly is hard to image. Words certainly cannot describe it. At times, it is almost eerie, spooky in a way. Our own Richland-Chambers Resevoir is also a good night fishing lake. This lake has a great number of large fish in it. 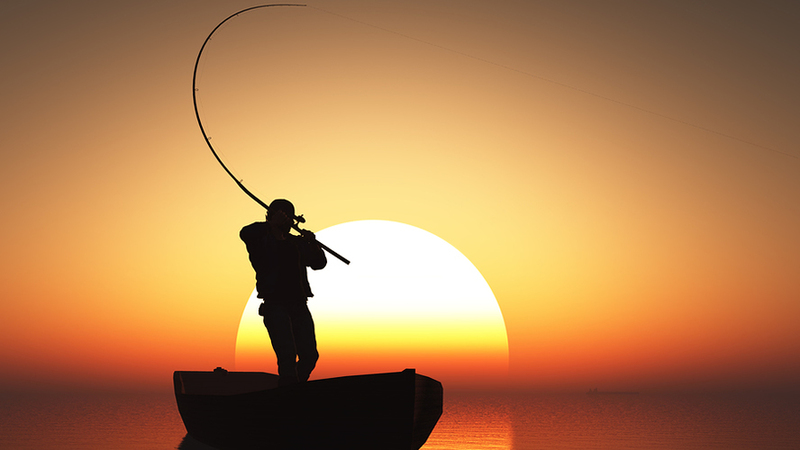 With the high amount of pressure it receives during the daylight hours, fishing at night not only gives you a different perspective on things, but the same is true for the fish. The baits will look different at night. Something the fish might not be use to. This can result in more fish being boated (then released, hopefully). Fishing at night from a boat requires an extra measure of safety. You need to know the water you will be fishing, develop a plan and stick to it, and slow down. Always wear an approved life vest and use your kill switches. I like night fishing when the moon is up. I am convinced the fishing is better and I know navigating the boat is easier with the moonlight. Be sure and use your running lights at all times when you are fishing at or near dark. We nearly ran over a ski boat two weeks ago, anchored just past the no wake buoy, after dark with no lights on, at Lake Whitney. I was glad I was driving slow enough to see it before it was too late. You have to be careful on the water at night. Unfortunately, there are still a few, uneducated, uncaring, idiots out there you have watch out for. When fishing at night, I use three baits: a spinnerbait with a Superdog Colorado blade for maximum vibration, a medium to deep diving crankbait and a plastic worm rigged with a loud rattle and plastic bead. I try to fish wind blown points at the mouths of creeks I feel like fish are feeding in. This time of year I focus on mid to lower end of the lake creeks. The water is usually a little cooler in the deeper end, thus the fish are a little more active. I switch back and forth between the three baits. If I catch a fish or two in an area on one type of bait, I will often work back through the same area with another bait and catch another fish or two. The main point is to fish your baits slowly. Like us, the fish have to rely on their other senses other than just sight to find the bait. Slow it down. If you are luck enough to live fairly close to a lake with smallmouth in it, I highly suggest you give them a try. If you are like me and love to fish, but hate the unbearable heat, try fishing for them at night. Believe me, there is nothing more exciting than catching a shallow water smallmouth, thrashing the water with everything he’s got……in the dark. It’s a rush.